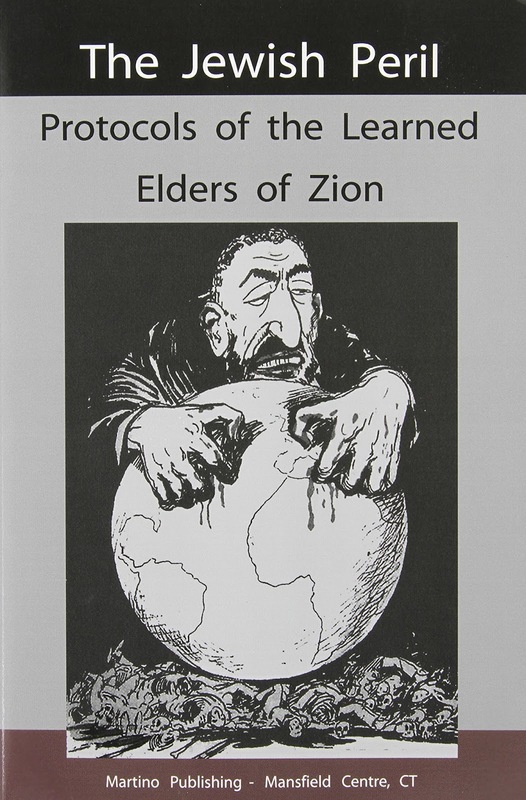 The Protocols of the Elders of Zion. World plot or forgery? – Blog De Las Sombras. Mirror. These “Protocols” attracted little attention until after the Russian Revolution of 1917, when the appearance of the Bolshevists, among whom were many Jews, professing and practising political doctrines that in some points resembled those advocated in the “Protocols”, led many to believe that Nilus’s alleged discovery was genuine. The “Protocols” were widely discussed and translated into several European languages. Their authenticity has been frequently attacked and many arguments have been abduced for the theory that they are a forgery. In the following articles our Constantinople Correspondent for the first time presents conclusive proof that the document is in the main a clumsy plagiarism. He has forwarded us a copy of the French book from which the plagiarism is made. 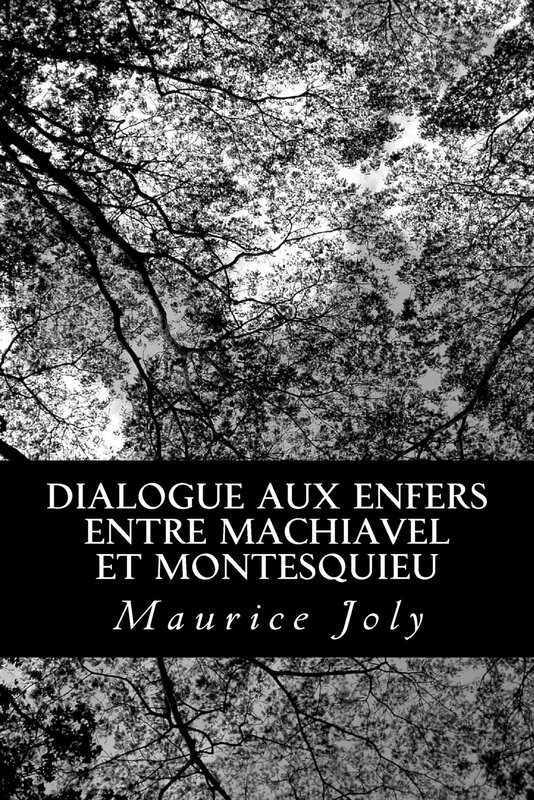 The British Museum has a complete copy of the book, which is entitled “Dialogue aux Enfers entre Machiavel et Montesquieu, ou la Politique de Machiavel au XIX Siecle. Par un Contemporain,” and was published at Brussels in 1865. Shortly after its publication the author, Maurice Joly, a Paris lawyer and publicist, was arrested by the police of Napoleon III and sentenced to 18 months imprisonment. Mr. X, who does not wish his real name to be known, is a Russian landowner with English connexions. Orthodox by religion, he is in political opinion, a Constitutional Monarchist. He came here as a refugee after the final failure of the White cause in South Russia. He had long been interested in the Jewish question as far as it concerned Russia, had studied the “Protocols,” and during the period of Denikin’s ascendancy had made investigations with the object of discovering whether any occult “Masonic” organization, such as the “Protocols” speak of, existed in Southern Russia. The only such organization was a Monarchist one. The discovery of the key to the problem of the “Protocols” came to him by chance. A few months ago he bought a number of old books from a former officer of the “Okhrana” (Political Police) who had fled to Constantinople. Among these books was a small volume in French, lacking the title-page, with dimensions of 5 ½ in. by 3 ¾ in. It had been cheaply rebound. On the leather back is printed in Latin capitals the word Joli. The preface, entitled “Simple avertissement,” is dated Geneva, October 15, 1864. The book contains 324 pages, of which numbers 315-322 inclusive follow page 24 in the only copy known to Mr. X, perhaps owing to a mistake when the book was rebound. Both the paper and the type are characteristic of the “sixties and seventies” of the last century. These details are given in the hope that they may lead to the discovery of the title of the book [see introduction above]. Mr. X. believes it must be rare, since, had it not been so, the “Protocols” would have speedily been recognized as a plagiarism by anyone who had read the original. The Geneva book is a very thinly-veiled attack on the despotism of Napoleon III in the form of a series of 25 dialogues divided into four parts. The speakers are Montesquieu and Machiavelli. In the brief preface to his book the anonymous author points out that it contains passages which are applicable to all Governments, “but it particularly personifies a political system which has not varied in its application for a single day since the fatal and alas! too distant date when it was enthroned.” Its references to the “Haussmannisation” of Paris, to the repressive measures and policy of the French Emperor, to his wasteful financial system, to his foreign wars, to his use of secret societies in hi s foreign policy (cf., his notorious relations with the Carbonari) and his suppression of them in France, to his relations with the Vatican, and to his control of the Press are unmistakable. The Geneva book, or as it will henceforth be called the Geneva Dialogues, opens with the meeting of the spirits of Montesquieu and Machiavelli on a desolate beach in the world of shades. After a lengthy exchange of civilities Montesquieu asks Machiavelli to explain why from an ardent Republican he had become the author of “The Prince” and “the founder of that somber school of thought which has made all crowned heads your disciples, but which is well fitted to justify the worst crimes of tyranny.” Machiavelli replies that he is a realist and proceeds to justify the teaching of “The Prince,” and to explain its applicability to the Western European States of 1864. In the first six “Geneva Dialogues” Montesquieu is given a chance of argument of which he avails himself. 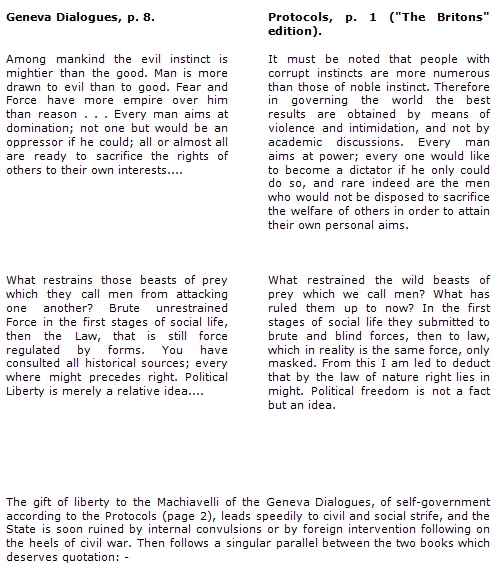 In the seventh dialogue, which corresponds to the fifth, sixth, seventh, and part of the eighth “Protocols,” he gives Machiavelli permission to describe at length how he would solve the problem of stabilizing political societies “incessantly disturbed by the spirit of anarchy and revolution.” Henceforth Machiavelli or in reality Napoleon III, speaking through Machiavelli, has the lion’s share of the dialogue. Montesquieu’s contributions thereto become more and more exclamatory; he is profoundly shocked by Machiavelli-Napoleon’s defense of an able and ruthless dictatorship, but his counter-arguments grow briefer and weaker. At times, indeed, the author of “L’Esprit des Lois” is made to cut as poor a figure as -parvum componere magno- does Dr. Watson when he attempts to talk criminology to Sherlock Holmes. A loan is an issue of Government paper which entails an obligation to pay interest amounting to a percentage of the total sum of the borrowed money. If a loan is at 5 per cent., then in 20 years the Government will have unnecessarily paid out a sum equal to that of the loan in order to cover the percentage. In 40 years it will have paid twice, and in 60 thrice that amount, but the loan will still remain an unpaid debt. – “Protocols,” p. 77. MONTESQUIEU,- “How are loans made? By the issue of bonds entailing on the Government the obligation to pay interest proportionate to the capital it has been paid. Thus, if a loan is at 5 per cent., the State, after 20 years, has paid out a sum equal to the borrowed capital. When 40 years have expired it has paid double, after 60 years triple: yet ir remains debtor for the entire capital sum.” -“Geneva Dialogues,” p. 250. But generally speaking “Protocols” 20 and 21, which deal (somewhat unconvincingly) with the financial programme of the Learned Elders, owe less to the “Geneva Dialogues,” Nos. 18-21, than to the imagination of the plagiarist author who had for once in a way to show a little originality. This is natural enough since the “Dialogues” in question describe the actual financial policy of the French Imperial Government, while the “Protocols” deal with the future. Again in the last four “Geneva Dialogues” Machiavelli’s apotheosis of the Second Empire, being based upon historical facts which took place between 1852 and 1864, obviously furnished scanty material for the plagiarist who wished to prove or, very possibly, had been ordered to prove in the “Protocols” that the ultimate aim of the leaders of Jewry was to give the world a ruler sprung from the House of David. We published yesterday an article from our Constantinople Correspondent, which showed that the notorious “Protocols of the Elders of Zion”,- one of the mysteries of the Elders of Zion” -one of the mysteries of politics since 1905 -were a clumsy forgery, the text being based on a book published in French in 1865. The disclusure, which naturally aroused the greatest interest among those familiar with Jewish questions, finally disposes of the “Protocols” as credible evidence of a Jewish plot against civilization. We publish below a second article, which gives further close parallels between the languate of the Protocols and that attributed to Machiavelli and Montesquieu in the volume dated from Geneva. Both “Machiavelli” and the author of the Protocols agree (Prot. P. 3, Geneva Dialogues, p. 11) almost in the same words that politics have nothing in common with morality. Right is described in the Protocols as “an abstract idea established by nothing,” in the Dialogues as an “infinitely vague” expression. The end, say both, justifies the means. “I pay less attention,” says Machiavelli, “to what is good and moral than to what is useful and necessary.” The Protocols (p. 4) use the same formula, substituting “profitable” for “useful.” According to the Protocols he who would rule “must have recourse to cunningness (sic) and hypocrisy.” In the second Dialogue (p. 15) Montesquieu reproaches Machiavelli for having “only two words to repeat – ‘Force’ and ‘guile.’ ” Both Machiavelli and the “Elders” [p. 13] of the Protocols preach despotism as the sole safeguard against anarchy. 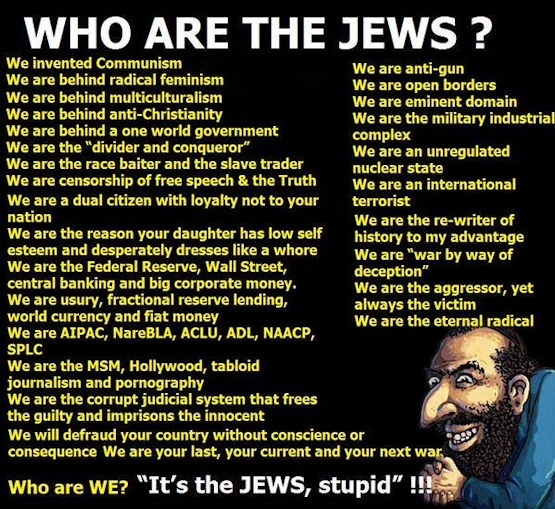 In the Protocols this despotism has to be Jewish and hereditary. Machiavelli’s despotism is obviously Napoleonic. There are scores of other parallels between the books. Fully 50 paragraphs of passages in the Dialogues are simply paraphrases of passages in the Dialogues. The quotation Per me reges regnant, rightly given in the Vieille France edition of the Protocols (p. 29), while regunt is substituted for regnant in the English version (p. 20), appears on p. 63 of the Geneva Dialogues. 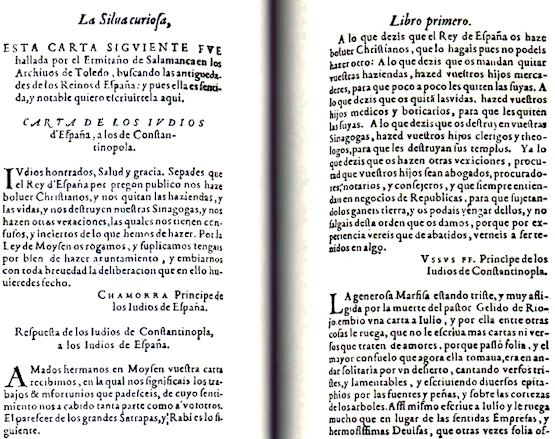 Sulla, whom the English version of the Protocols insists on calling “Silla,” appears in both books. After covering Italy with blood, Sulla reappeared in as a simple citizen in Rome: no one durst touch a hair of his head. Geneva Dialogues, p. 159. Remember at the time when Italy was streaming with blood, she did not touch a hair of Silla’s head, and he was the man who made her blood pour out. Protocols, p. 51. Montesquieu:– “Now I understand the figure of the god Vishnu; you have a hundred arms like the Indian idol, and each of your fingers touches a spring. Both the Elders and Machiavelli propose to make political crime thoroughly unpopular by assimilating the treatment of the political criminal to that of the felon. Both devote not a little attention to police organization and espionage; the creator of Machiavelli had evidently studied Napoleon III’s police methods and suffered at the hands of his agents. Each proposes to exercise a severe control over the Bar and the Bench. As regards the Vatican, Machiavelli-Napoleon, with recent Italian history in mind, aims at the complete control of the Papacy. After inflaming popular hatred against the Church of Rome and its clergy, he will intervene to protect the Holy See, as Napoleon III did intervene, when “the chassepôts worked wonders.” The learned Elders propose to follow a similar plan: “when the people in their rage throw themselves on to the Vatican we shall appear as its protectors in order to stop bloodshed.” Ultimately, of course, they mean to destroy the Church. The terrible chiefs of a Pan-Judaic conspiracy could hardly have any other plan of campaign. Machiavelli, naturally, does not go so far. Enough for him if the Pope is safely lodged in the Napoleonic pockets. Is it necessary to produce further proofs that the majority of the Protocols are simply paraphrases of the Geneva Dialogues, with wicked Hebrew Elders, and finally an Israelite world ruler in the place of Machiavelli-Napoleon III, and the brutish goyim (Gentiles) substituted for the fickle masses, “gripped in a vice by poverty, ridden by sensuality, devoured by ambition,” whom Machiavelli intends to win? In articles from our Constantinople Correspondent, published yesterday and on Tuesday, we proved that the so called “Protocols of the Elders of Zion,” which have been believed by some since their publication in 1905 to indicate a Jewish plot against civilization, was a clumsy forgery. To-day our Correspondent reviews the use to which the Protocols were put in recent Russian politics, and summarizes his conclusion. The Third Napoleon’s secret police, many of whom were Corsicans, must have known the existence of the Dialogues and almost certainly obtained them from some of the many persons arrested on the charge of political conspiracy during the reign of of Napoleon III. In the last two decades of the 19th century and in the early years of the 20th there were always a few Corsicans in the Palace Police of the Tsar, and in the Russian secret service. Combining courage with secretiveness, a high average of intelligence with fidelity to his chief, the Corsican makes a first-class secret agent or bodyguard. It is not improbably that Corsicans who had been in the service of Napoleon III, or who had had kinsmen in his secret service, brought the Geneva Dialogues to Russia, where some member of the Okhrana or some Court official obtained possession of them, But this is only a theory. As to the Protocols, they were first published in 1905 at Tsarskoye Selo in the second edition of a book entitled “The Great Within the Small,” the author of which was Professor Sergei Nilus. Professor Nilus has been described to the writer as a learned, pious, credulous Conservative, who combined much theological and some historical erudition with a singular lack of knowledge of the world. In January, 1917, Nilus, according to the introduction to the French version of the Protocols, published a book, entitled “It is Here, at Our Doors! !” in which he republished the Protocols. In this latter work, according to the French version, Professor Nilus stated that the manuscript of the Protocols was given him by Alexis Nicolaievich Sukhotin, a noble who afterwards became Vice-Governor of Stavropol. Such are Professor Nilus’s rather contradictory accounts of the origin of the Protocols. Not a very convincing story! Theodor Herzl is dead; Sukhotin is dead, and where are the signatures of the Zionist representatives of the 33rd Degree? Turning to the text of the Protocols, and comparing it with that of the Geneva Dialogues, one is struck by the absence of any effort on the part of the plagiarist to conceal his plagiarism. The paraphrasing has been very careless; parts of sentences, whole phrases at times, are identical; the development of the thought is the same; there has been no attempt worth mentioning to alter the order of the Geneva Dialogues. The plagiarist has introduced Darwin, Marx, and Nietzsche in one passage in order to be “up to date”; he has given a Jewish colour to “Machiavelli’s” schemes for dictatorship, but he has utterly failed to conceal his indebtedness to the Geneva Dialogues. This gives the impression that the real writer of the Protocols, who does not seem to have had anything to do with Nilus and may have been some quite unimportant prècis writer employed by the Court or by the Okhrana, was obliged to paraphrase the original at short notice. A proof of Jewish conspiracy was required at once as a weapon for the Conservatives against the Liberal elements in Russia. Mr. X, the discoverer of the plagiarism, informs me that Protocols, shortly after their discovery in 1901, four years before their publication by Professor Nilus, served a subsidiary purpose, namely, the first defeat of Monsieur Philippe, a French hypnotist and thought-reader, who acquired considerable influence over the Tsar and Tsaritsa at the beginning of the present century. The Court favorite was disliked by certain great personages, and incurred the natural jealousy of the monks, thaumaturgists, and similar adventurers who hoped to capture the Tsar though the Empress in their own interest, or in that of various cliques. Philippe was not a Jew, but it was easy to represent a Frenchman from “that nest of Jewish conspiracy” as a Zionist agent. Philippe fell from favour, to return to Russia and find himself once more in the Court’s good graces at a later date. But the principal importance of the Protocols was their use during the first Russian revolution. This revolution was supported by the Jewish element in Russia, notably by the Jewish Bund. The Okhrana organization knew this perfectly well; it had its Jewish and crypto-Jewish agents, one of whom afterwards assassinated M. Stolypin; it was in league with the powerful Conservative faction; with its allies it sought to gain the Tsar’s ear. For many years before the Russian revolution of 1905-1906 there had been a tale of a secret council of Rabbis who plotted ceaselessly against the Orthodox. The publication of the Protocols in 1905 certainly came at an opportune moment for the Conservatives. It is said by some Russians that the manuscript of the Protocols was communicated to the Tsar early in 1905, and that its communication contributed to the fall of the Liberal Prince Svitopolk-Mirski in that year and the subsequent strong reactionary movement. However that may be, the date and place of publication of Nilus’s first edition of the Protocols are most significant now that we know that the originals which were given him were simply paraphrases. So much for the Protocols. They have done harm not so much, in the writer’s opinion, by arousing anti-Jewish feeling, which is older than the Protocols and will persist in all countries where there is a Jewish problem until that problem is solved; rather, they have done harm by persuading all sorts of mostly well-to-do people that every recent manifestation of discontent on the part of the poor is an unnatural phenomenon, a factitious agitation caused by a secret society of Jews. 1650: Francisco de Quevedo. La isla de los Monopantos. 1848: Alexandre Dumas, père. Joseph Balsamo. Mémoires d’un médecin: Joseph Balsamo, 1846–1848).